- This auto tuner will only work in conjunction with a PyroPak ignition controller. - Do NOT use with leaded race fuels. The Dragonfire Racing PyroPak Auto Tuner is a "add on" accessory that can be used with any Dragonfire Racing PyroPak ECU Controller. It connects to the PyroPak wiith a single cable and requires only a ground and +12 volt connection to be made to install. A "weld in" O2 sensor bung is included in this kit in case your exhaust system doesn't have one currently. 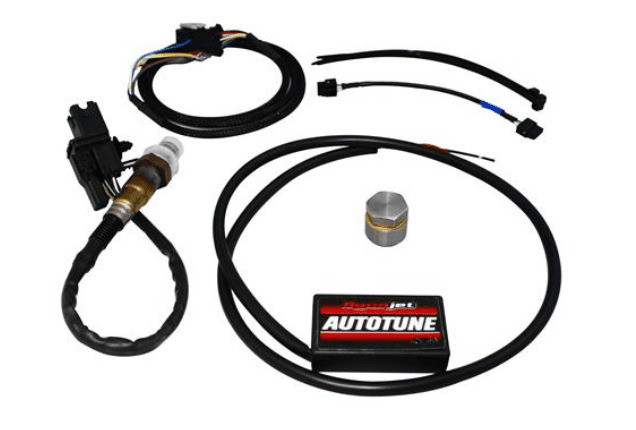 The PyroPak Auto Tuner takes virtually the same technology that Tuning Link dynamometer softwar (for automated Dyno tuning) uses, along with wideband O2 sensors and is designed to be used on your side by side. Once installed the PyroPak Auto Tuner monitors the air/fuel mixture and then sends the information to the PyroPak Controller and automatically corrects the settings to the optimal air/fuel ratio while you continue to ride, letting your simply plug in the unit and start riding. This add on to your PyroPak Controller will let you get the maximum performance gains regardless of where or how you like to ride your UTV!